Baby Milk Action welcomes reports from the public of marketing practices for formula, feeding bottles and teats that they think might break marketing rules. Your donations and membership fees help us to act on these reports. Recently we have been asked about a new brand of formula being sold for £1.00 (one pound) for a 400 g tin, as in the example below. Some people have been queried whether this low price breaks the Infant Formula and Follow-on Formula Regulations (2007) or the International Code of Marketing of Breastmilk Substitutes and subsequent, relevant Resolutions of the World Health Assembly. The display of the formula is not promotional. If there were signs saying “Low Price”, “Discount”, “Look at this” or even “New! !”, that would be a promotional activity. Displaying the price in a normal way is clearly allowed. There are people who need or want to buy formula and they need to know the price. either directly, or indirectly through the health care system or health workers. If the formula was reduced as a temporary measure to capture consumers that would be illegal. When free supplies or promotional prices come to an end, parents may find they can no longer afford to purchase the products and what happens then? However, the store has confirmed in a reply to a member of the public on twitter, copied to Baby Milk Action, that the price is permanent and will not change. If a manufacturer discounts the price to retailers, that would be a breach of these requirements. It is unclear if this has occurred (see price discussion below). That is not the end of the legal questions, however. There is the question of the composition of the formula. Section 8 of the Infant Formula and Follow-on Formula Regulations (2007) requires that infant formula must meet specified composition requirement. These include all ingredients known to be necessary for infant nutrition. Companies sometimes add other ingredients and often base marketing campaigns around these, but these ingredients have no proven benefit, otherwise they would be included in the composition requirements. In other words, any formula on the market should meet the nutritional requirements of the child, as currently understood. We have long said that price and the preferences of the child are as good reasons as any for choosing one brand over another. Given this product is new on the UK market, there is a requirement in section 13 of the Law to inform the authorities by sending “a model of the label used for the product”. Baby Milk Action contacted the Department of Heath to confirm if this had happened, whether any check had been made that the composition requirements are being met and to ask what action was being taken over the breaches of the labelling requirements. We are also fortunate to have the independent First Steps Nutrition Trust in the UK, which assesses formulas on the market in its Infant Milks in the UK reports and will add the formula to its reports if it continues to be sold in the UK. Pictures or text which imply that infant health, happiness or well being, or the health, happiness and wellbeing of carers, is associated with infant formula. Baby or child related subjects (e.g. toys, cots or young animals) and anthropomorphic characters, pictures and logos. Non-mandatory pictures or text which refers, directly or indirectly, to ‘the ideal method’ of infant feeding. References to such terms would not comply with regulation 17 (3). We believe the label is in breach of these provisions. It features young animals and has the idealising claim “natures freshness”. The claim is not only idealising, but misleading, as powdered formula is a processed food with a shelf life of two years. On this basis, Baby Milk Action reported the product to the responsible authority calling for an Improvement Notice to be issued to give the manufacturer a deadline for bringing the labels into compliance. We understand that the importer will be issued with an Improvement Notice requiring any future imports to comply with regard to labelling and pricing. As far as we are aware, this will be the first time an Improvement Notice is issued for formula marketing in the UK under the Statutory Instrument that came into force on 20 July 2016. Why is other formula so expensive? 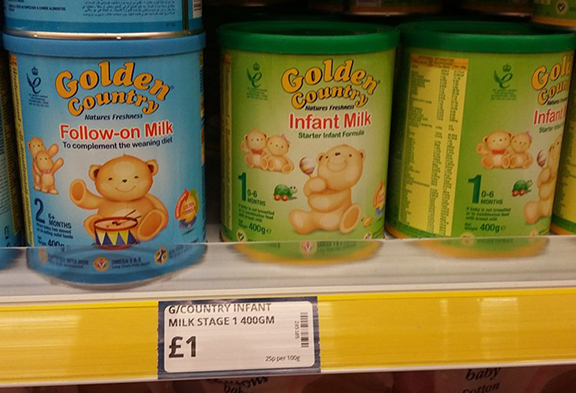 When formula can be sold at £1.00 for 400 g, it does raise a question over whether it has been discounted, but it also highlights another issue. Why are heavily advertised brands so much more expensive? The answer is in the question: the price of promotion goes onto the products. In addition, manufacturers price certain brands as premium products as consumers will assume that a more expensive product is better. This is the case with Aptamil formula. 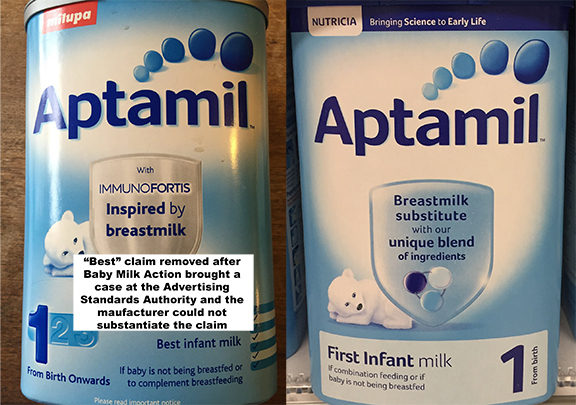 We brought a case before the Advertising Standards Authority in 2009 when Danone claimed that Aptamil is the “best” formula in advertising for the follow-on product (it cannot advertise infant formula so advertising the identically branded follow-on formula). The ASA ruled that this claim was misleading as the company could not substantiate its claim. Subsequently, the term “best formula” was removed from labels, as shown below. Danone continues to market Aptamil at a higher price than Cow & Gate formula, as a premium product. Similarly, we won a case in 2012 against the claim that SMA is the best formula. The ASA ruling states: “the ads misleading implied that SMA Follow-on milk was superior to other follow-on milks”. The SMA brand has since been taken over by Nestlé, which continues to falsely imply that SMA is better than other formulas. Nestlé and Danone are locked in an aggressive marketing war in the UK, as in other countries. The cost of the television advertising, foreign trips for health workers, study days and the rest of the promotion goes onto the cost of their products. Formula is also one of the most profitable products on the supermarket shelves. No promotion = Cheaper formula. If you value having a not-for-profit organisation to investigate these cases, please consider helping Baby Milk Action. We struggle to keep operating and need your donations and membership fees to enable us to do so. A donation of any size is welcome. Membership fees start from from just £1.00 per month. I notice that Aptamil has a baby bear on its label – does this break the same rules? Yes. We have raised this with the authorities repeatedly. Know that we have the Improvement Notice regime, we are trying again. Our campaign to make these legally binding was successful.